Memorial Day is just a couple of weeks away, which means BBQ season is in full swing. One of the most popular sides at a BBQ are those delicious pasta salads. 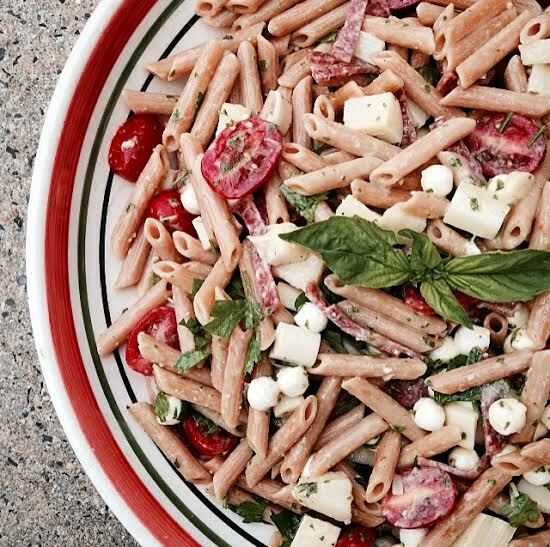 The ideas of what to create for a pasta salad are endless. I personally love adding fresh herbs to mine. It makes for added freshness and taste. To this salad I wanted to have a healthier choice on the pasta, so I found a red lentil gluten free penne pasta. The combination of this salad is one that will make your guests keep coming back for more. Make it in the spur of the moment or ahead of time. Bring a large pot of water to a boil. Make sure to season the water with plenty of salt. Follow the cooking instructions on the packaging. Cook until AL DENTE about 10 minutes with this pasta. Drain and cool off. Place all the ingredients in a large bowl and set aside. In a food processor add all of the ingredients. Process until well combined. Pour over salad. Toss everything together and serve.